What a super exhibition it turned out to be! We’d like to extend our thanks to all who exhibited, all who invigilated, and especially all who helped to make this such a successful exhibition – we couldn’t have done it without you. We think Trades House was a great choice of venue, and we’d like to hold exhibitions there in future, so we are asking you for your thoughts on the exhibition and the venue. Please send us any feedback you have, it really helps with future planning. Also let us know if you have good photos or video; send us your instagram links. 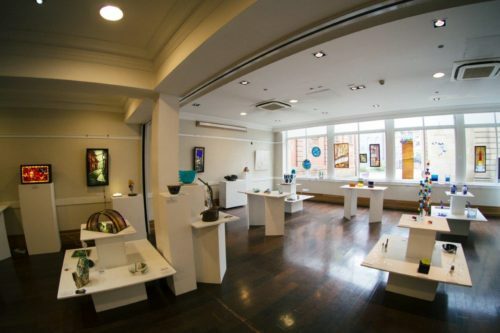 Our joint exhibition with Contemporary Glass Society was a great success. It was based in Trades House in the Merchant City in Glasgow and timed to coincide with the Glasgow Doors Open Festival. Trades House was open to the public on the Saturday and Sunday guaranteeing a large footfall throughout the building and as we had hoped taking time to visit the exhibition. The aims of the exhibition were to demonstrate how glorious and amazing contemporary glass is and to act as a showcase for our Scottish glass artists. 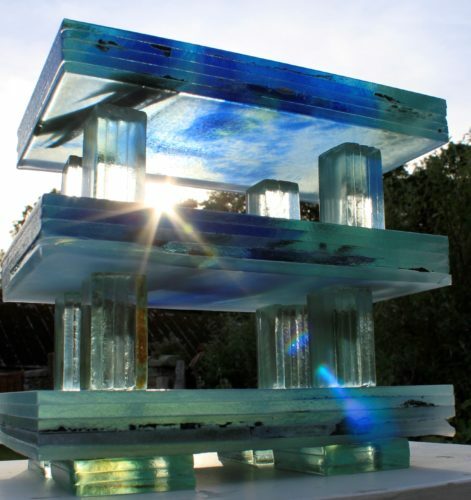 Some 30+ artists exhibited with over 80 glass works on display. Eilidh MacKenzie, a well-respected glass artist and SGS member, curated the exhibition and took full advantage of the design of the room which seems particularly suited to glass display; easily navigable with huge glass windows emitting natural light, which perfectly complemented each objet d’art. Thanks are due to Eilidh for her considered approach. 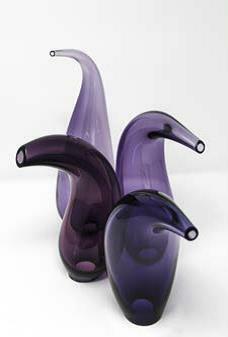 With such an exciting, eclectic collection on exhibit it’s fair to say that Glorious Glass! was a collaboration of unquestionable success. The standard on display was incomparable, the creative processes extremely varied and the technical ability simply breathtaking. With over 550 visitors taking time to enjoy the exhibits and learn about the various artists and techniques we more than met our aims for promoting glass art in Scotland. Alan J Poole provided an award of Dan Klein’s book ‘Artists in Glass’ which we chose to present to an outstanding exhibit. We asked a mystery shopper, a recognised glass artist and collector in Scotland, to choose a piece which Dan and Alan would have wanted to add to their collection. The award went to Kate Henderson and Anita Pate for ‘Depth no 1’. So that they did not have to work out a rota for sharing the book Alan very kindly provided another copy. The People’s Choice voted on by visitors to the exhibition went to Ashley Brammer. 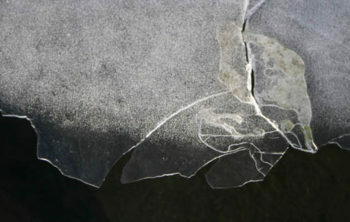 Ash is based in Fyvie and works mainly in fused and cast glass. 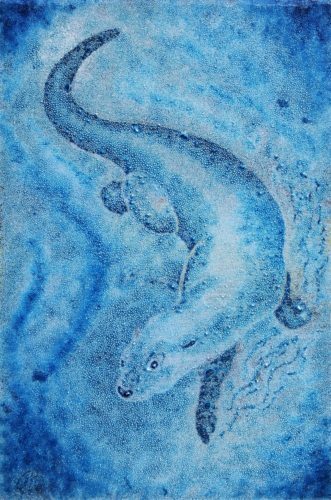 His piece ‘Diving Otter’ is ‘created entirely from bubbles trapped in layers in the glass, perfectly encapsulating the spirit of this enigmatic aquatic animal’. His two other exhibits ‘Cattier than thou’ and ‘Red Z’ were equally engaging. Thanks to Catherine Lowe for her generous donation of a voucher for Stained Glass Supplies for The People’s Choice.